First Line: The maze is twenty-five hundred yards square. Manderley Resort is a brand-new twenty-story hotel on the California coast. It's almost ready to open its doors to those with the means to afford its opulence and unparalleled security. But someone is determined that the luxury hotel will never open. With the staff working flat out to finish all the last minute details, they are completely unaware that their every move is being watched... and that over the next twelve hours they will be killed off, one by one. Security isn't a run-of-the-mill murder mystery. For one thing, the story appears to be told from varying security camera angles, and there can be abrupt switches in points of view when the action moves from one camera angle to another. I had no problems following this, but I did have a couple of issues with other things. I tend to be a character-driven reader. I like to have at least one character whom I like and/or trust, but even that's not cast in stone-- which is a good thing because none of the characters here are very likable. Tessa (hotel employee) and Brian (a man who shows up out of the blue) seem to be the main characters, but the rest of the cast are mere cannon fodder for the roaming team of killers while readers are treated to voyeuristic scenes from various cameras. To be honest, I only began to enjoy the book once the real narrator was revealed toward the end. One of the main reasons I love to read crime fiction is to have the universal question of "Why?" answered. I want to know why the crimes are being committed. In Security, readers are never told with any certainty why ruthless killers are turning Manderley Resort into a blood-soaked house of horrors. 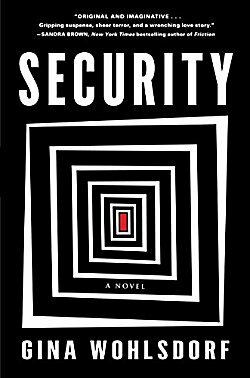 Multiple points of view, unanswered questions, and a story that ends with an unfinished sentence (I liked that)... while I didn't find Security to be wholly satisfying, I did find its more unconventional aspects intriguing and promising. I'll be interested in reading Gina Wohlsdorf's next book. Oh no Cathy, I like to know 'why' also. Hmmm looks like the author tried something new. I am still intrigued.